You can add the Stocks gadget to your Sidebar in Windows Vista to access the latest stock quotes at a glance. No longer do you have to check out separate Web sites for your stock info; instead, up-to-date stock quotes will stream to your desktop. 1Add the Stocks gadget to the Sidebar. You can access the Stocks gadget easier and more quickly by adding it to the Sidebar. Just click the Gadgets symbol (the plus sign) at the top of the Sidebar to open the Gadget Gallery. Then click and drag the Stocks gadget to the Sidebar. 2Click and drag the gadget to the desktop. Doing so allows you to view more information. 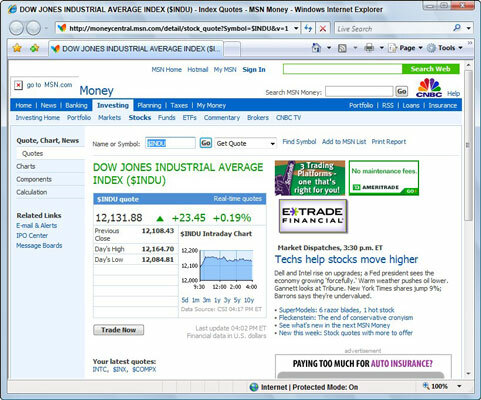 When you connect to the Internet, stock prices and stock exchange data are displayed. 4Click the Search for a Stock button and enter a stock symbol. The Search for a Stock button is a plus sign in the bottom-right corner. When you click the Search button, the price is displayed. 6Click on a stock exchange. 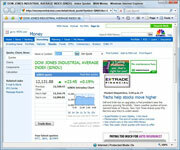 If you click on a stock exchange, you can display detailed information about that stock exchange in your browser. Close the browser by clicking the Close button. 8Click the Show Stock Graph icon. By clicking the Show Stock Graph icon — a squiggly line symbol in the bottom-right corner of the Stocks gadget — you can view a graph of activity for the day.